Pieces of the rocket carrying the moon-probe Chang'e-3 have damaged two farming households in Suining county, Central China's Hunan Province after the successful launch on Monday morning, a local official told the Global Times on Tuesday. No injuries were caused, Zeng Jiancheng, an official from the county's People's Armed Forces Departments (PAFD) told the Global Times. The owners of the broken houses have been reimbursed by the Xichang Satellite Launch Center, the official said. The Chang'e-3 lunar probe was launched at 1:30 am from Xichang in Southwest China's Sichuan Province on Monday. 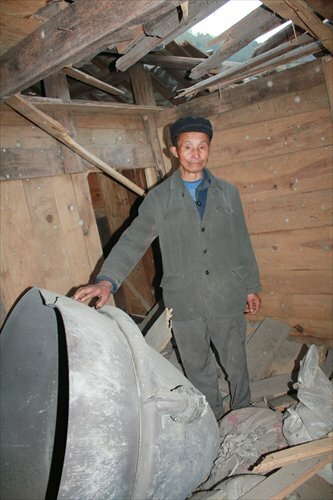 Debris from the rocket crashed into the granary of Yang Weihan, a villager in Wawutang township, Suining county, the Changsha-based Xiaoxiang Morning Herald reported. The debris has smashed a large hole on the roof of the granary, and a ton of rice was also ruined by the tiles and beams broken by the wreckage of the rocket, said Yang. After field evaluations, Yang was given compensation of 10,800 yuan ($1,772) and Yuan Shifa, another owner of a broken house hit by a 1.5-meter long rocket piece, who received 5,200 yuan in compensation. By 3:00 pm on Sunday, over 160,000 people living in 11 townships of the county were evacuated to avoid danger from falling rocket pieces, Zeng said. Since 1992, Suining has seen many village evacuations during about 30 launches of rockets from Xichang, Zeng said. Most of the time, the wreckage has damaged property, save for two cases where people died from electric shock by accidentally touching the high-voltage power lines cut loose by fallen rocket pieces. Ren Zili, a law professor from Beihang University told the Global Times that the rocket center should follow the model of some other countries and buy commercial insurance for locals whose safety or property might be threatened by the launch.